The dental consultation allows for effective communication between companion animal owners, and veterinarians. The owner's primary concern(s), an accurate history, examination findings, presumptive diagnosis, prognosis, as well as, diagnostic and treatment plans are all discussed. Our focus will be on the oral examination of companion animals. Veterinarians understand the benefit of thorough physical exams for companion animals. The oral examination should be part of every general physical exam. Clinical manifestations of metabolic disease may be found only in the oral cavity. Failure to perform the oral exam could delay a diagnosis or result in the misdiagnosis of medical conditions. The general physical exam is also integral to the performance of the comprehensive oral exam. Enlargement of extraoral lymphatic tissue can alert the examiner to oral disease. Anesthesia is important in performing the comprehensive intraoral exam, and it also allows for diagnostic testing. The general physical exam is fundamental to the establishment of an optimal anesthesia protocol. A comprehensive oral exam includes non-sedated awake evaluations of the head and neck, as well as, a sedated or an anesthetized intraoral evaluation. A systematic approach to the oral exam is most efficient when a dental chart (see canine or feline) with an anatomic checklist is used. Abnormal or suspicious findings are recorded on the dental chart using objective indices. This avoids missing important details and allows for comparison of findings between periodic oral exams. Examination of the skull can yield important information about the oral cavity. Within species, skull shape and size vary between breeds. These variations play a significant role in the extraoral and intraoral appearance, as well as with dental occlusal relationships. The veterinarian must be familiar with these anatomic variations. The cephalic index can be used for the categorization of cat and dog breeds based on skull shape and size. The brachycephalic skull is relatively wide (broad) and short. 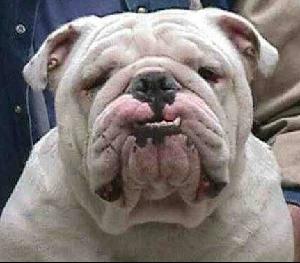 The Bulldog or Shih tzu breeds are canine examples. The Himalayan and Persians are feline brachycephalic breeds. The "extreme" brachycephalic breeds have a very short muzzle (Pugs). Brachycephalic breeds with a complete dentition often have dental crowding with tooth rotation, and a relatively high incidence of periodontal disease. It has been the author's experience that many small ("toy") and brachycephalic dogs have missing teeth or unerupted, embedded teeth. Teeth may become embedded due to dental crowding, rotation or lack of space for normal eruption. The first premolar in any of the four dental arches may appear to be missing. The lower first premolar is often missing bilaterally. Every time a tooth appears to be missing, dental radiographs are needed to rule out embedded teeth. Embedded teeth may result in the formation of oral cysts (such as the dentigerous cyst), which may be locally destructive and lead to serious consequences. Chronic obstructive respiratory syndrome (CORS) of brachycephalic breeds has been described. Anatomic variations associated with CORS are hyperplasia and elongation of the soft palate, eversion of the lateral saccules, stenotic nares, tracheal collapse and laryngeal hypoplasia. The soft palate should not extend distal to the tip of the epiglottis. This evaluation should be performed prior to intubation and without tongue retraction. Everted laryngeal saccules appear as off white mushroom shaped structures mesial to the vocal cords. Laryngeal collapse is identified as medial tipping of the corniculate processes and flattening of the uniform process of the arytenoid cartilage. The veterinarian should anticipate and be prepared for complications especially when working with brachcephalic patients. 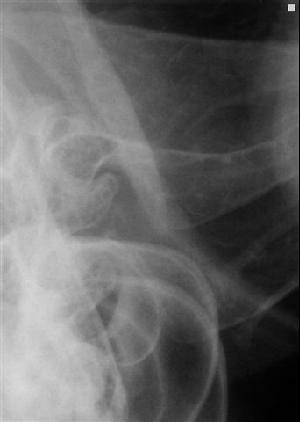 Tracheal intubation may be difficult due to tracheal hypoplasia, and airway obstruction may complicate anesthesia recovery. The author extubates brachycephalic patients at the latest possible time, and monitors them continuously after extubation to ensure normal breathing. The mesocephalic breeds have muzzlees of intermediate width and length. The Alaskan Malamute, German Shepherd and Black Labradors are examples. Dental crowding and periodontal disease are less common with mesiocephalic compared to the brachycephalic breeds. The author has also found high incidence of missing premolar teeth in some of the mesiocephalic breeds. Any of the premolars may be involved; however, the incidence seems highest with the first and the fourth premolar teeth. Since missing teeth are likely to be inherited, the comprehensive oral exam must include dental radiographs. Radiographs confirm that the teeth are missing rather than embedded, they also rule out dentigerous cysts and allow for ethical discussions with regard to discouraging breeding of these animals. The dolichocephalic skull has a relatively long and narrow muzzle. 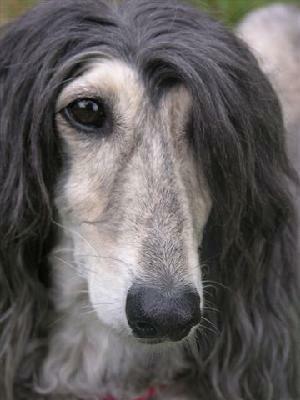 The Borzoi, Saluki and Whippet are examples of dolicocephalic breeds. The author has observed posterior crossbite, in dolichocephalic breeds. Posterior crossbite is a malocclusion that involves an unusual relationship between the upper fourth premolar and the opposing lower first molar teeth. Dogs with posterior crossbite have their upper fourth premolars positioned lingual to the lower first molar, rather than the normal buccal orientation. This malocclusion may result in a less effective "shearing" activity of the carnasal teeth. There may also be an increase of plaque and calculus accumulations. Young to middle aged dolicocephalic breeds may be at an increased risk of developing fungal (Aspirgillus fumigatus) infections of the nasal passages compared to breeds with other skull shapes. These dogs initially present with a unilateral hemorrhagic and mucopurulent nasal discharge. Disease progression often results in bilateral nasal discharge. The nasal plannum may be depigmented and the patient is painful with manipulation of the nose. Rhinoscopy, computed tomography (CT) and fungal cultures help establish the diagnosis. to the upper fourth premolar tooth. An excellent review of the skeletal and dental abnormalities in wild, domestic and laboratory rabbits has been published by Okuda et. al. in the Journal of Veterinary Dentistry Vol. 24, No.4, p224-229, December 2007. Skull measurements were compared, dental occlusion was assessed and dietary habits were studied. It was interesting to note that in this study 100% of the domestic pet rabbits had incisor root elongation (32 rabbits studied). This cannot be determined without dental radiography or other imaging studies. Facial symmetry (as viewed from the front and top of the head), alopecia, draining tracts, discharge, scarring or swellings should be noted on the dental chart. Palpation of the face may identify firm or fluctuant masses. Lymphatic and salivary tissue should also be palpated. Odor from the ears, mouth, nose or skin should also be noted on the dental chart. Opening and closing of the mouth may reveal temporal mandibular joint crepitation, or popping and clicking sounds. Symphyseal instability may be identified while palpating the left and right mandibles. Facial swelling evident on extraoral Right suborbital swelling. Swelling below the lower jaws. Left suborbital swelling. on the zygomatic (cheek) bone. osteosarcoma (by histology). Front extraoral view of rabbit. Right side extraoral view of rabbit. The extraoral exam of rabbits and rodents may reveal root elongation as palpable protrusions at the ventral aspect of the mandible, or facial protrusions of the maxilla adjacent to the zygomatic arch. Excessive salivation may be evident as a wet facial or mandibular dermatitis. This is sometimes called "slobbers" or "wet dewlap". Ocular discharge in rabbits and rodents may be an indication of maxillary cheek teeth elongation. Every rabbit that has ocular discharge or excessive salivation should be evaluated radiographically. The incisor occlusion can usually be evaluated during the extraoral exam. The author provides consultations with companion animal owners before, during, and after an awake intraoral exam. Observations from the brief exam can help with client communication. Informed consent is obtained to perform a comprehensive exam with the necessary diagnostics, and to provide dental or oral surgical services. The intraoral exam must be approached differently in cats, dogs and rabbits. An assistant can be helpful for restraint of any animal; however, it is especially important when examining rabbits to avoid injury to the patient and the examiner. The initial exam for cats, dogs and rabbits is attempted with the mouth closed. The upper and lower lips are viewed and then gently separated to get views of the dentition, oral mucosa and the dental occlusion. Front and side views of the oral cavity of cats and dogs may allow for partial observation (some surfaces) of all of the teeth. For rabbits, the incisor occlusion is evaluated, and the cheek teeth are not viewable. For cats, the author prefers to sit or stand directly behind the patient for the intraoral exam. To reduce stress and to help comfort the cat, the examiner will speak softly, and gently pet the head and neck prior to the intraoral exam. The neck and mandibular lymph nodes are palpated. The head is then tilted back with the nose pointing toward the ceiling. The lower jaw will relax and a forefinger is used to gently pull the lower incisors downward (slightly) to open the mouth. The oral cavity can then be viewed. The dog is approached from the side for the intraoral exam. An assistant can be particualrly helpful in gently securing the head. A closed mouth, followed by an open mouth exam is performed from the front and both sides. The mandibles and the maxillas are held in the premolar region to slowly and gently open the mouth. 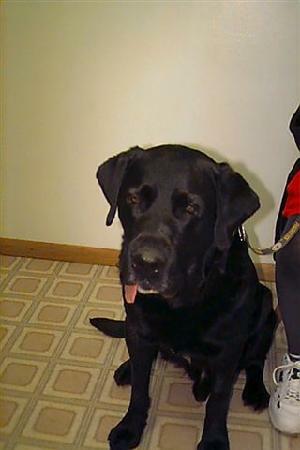 Allowing dogs to open and close the mouth helps with the awake oral exam. Forcing the mouth open and holding it open will result in patient resistance and difficulty for the examiner. Examination of the awake rabbit requires patience and an understanding of lagamorph behavior. The assistant should secure the rabbit to avoid the rear legs from thrusting out and causing injury. Rabbits have a wide diastema (space between the incisors and the cheek teeth) that allows the introduction of an otoscope or other illuminated speculum. A brief view of the palate, teeth, tongue and oral mucosa is possible. The awake intraoral exam can be very revealing; however, looking into the mouth is often not even possible without chemical restraint. The use of the 6" cotton tip applicator helps the examiner view oral anatomy and to avoid personal injury. Caution and patience is strongly encouraged. Gently touching his chin. Gently opening his mouth at the lower jaw. Slowly and firmly opening his mouth. This is repeated for breif visual inspections. and fought with an open mouth exam. when examining fearful or fractious finger injury. Front view of gingiva and occlusion. Right side view of teeth and gingiva. Quick view of hard and soft palate. View of right front teeth and gingiva. avoid injury; however, the anesthetized oral exam is needed for further evaluation. Clinical photos of the intraoral exam of a dog. Front right side view of Dakota. Front left side view of Dakota. Back right side view of Dakota. Back left side view of Dakota. Cotton tip applicator oral exam of a Left front view using cotton tip applicator. dog. Note the muzzle is held closed. Front view with cotton tip applicator. View of the back of the right side. Initial view of the incisor occlusion. View of the oral mucosa. Speculum helps with intraoral views. The speculum is gently moved side to side. A view of the upper dental arch. The tongue can be briefly viewed. Fundamental knowledge of the normal primary, secondary and mixed (primary and secondary) dentition is necessary to perform the oral exam. A basic understanding of primary and secondary teeth eruption (time range) is important to be able to differentiate between normal and abnormal development. the eruption of the secondary incisors. discolored lower right canine tooth. and primary canine teeth. 19 week puppy with secondary incisors Right view of 19 week puppy. left upper primary canine tooth. canine results in a persistent primary lower secondary canines. From Wiggs and Lobprise; Common Dental Procedures, AAHA Press, 2000. Rabbits have aradicular (no true roots) hypsodont teeth (elongated crown height). All teeth (incisors, premolars and molars) continually erupt. The rate of eruption varies between mandibular and maxillary teeth. The mandibular cheek teeth have a higher rate of eruption compared to the maxillary cheek teeth. Evaluation of the Occlusion; Is the Bite Right? The examiner must think, and arrive at answers to the following questions to determine if their observations are normal and whether further evaluations are indicated. premolars should interdigitate with the lower premolars positioned mesial (in front of) to the upper opposing teeth. The coronal tip of the lower premolars are positioned in the interdental space of the upper premolars. The lower fourth premolar cusp tip is positioned between the upper third and fourth premolar. The succeeding third, second and first premolars have the same relationship bilaterally. Do the teeth occlude functionally and non-traumatically? 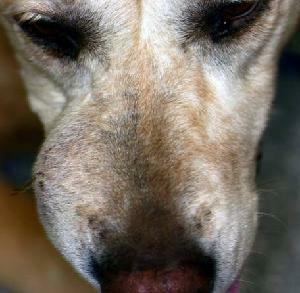 Tooth-on-tooth contact or tooth on soft tissue trauma can be very painful for companion animals. These are examples of traumatic malocclusions. Are the normal number of teeth present? Missing or supernumerary teeth must be recognized. Abnormal tooth structure (enamel defects or fractures), abnormal tooth shape (malformations) or tooth discoloration may be identified. Fractured and worn teeth may be present. Any of these abnormal findings are charted. The dental occlusion of rabbits is directly related to the balance between tooth eruption and wear. The awake oral exam can be performed with appropriate patient restraint and the use of an otoscope or other speculum (nasal or vaginal). The anatomic limitations of the temporal mandibular joint motion, and the relatively small oral cavity opening make this procedure particularly difficult. The incisor occlusion can be evaluated during the awake exam; however, the cheek teeth require radiographic imaging. The author prefers non-screened mammography film, dental radiographs or both. An endoscope is an excellent method of oral and dental evaluation. has been called "base narrow canine". behind the left and right upper first incisors. tissue contact. This is called a "wry bite". photograph. Note the unerupted and the unerupted first premolar tooth. Surgical view of unerupted tooth. Surgical view of unerupted tooth. The gingiva, alveolar mucosa, cheek mucosa, lips, palate, incisive papilla, tongue and floor of the mouth may be briefly viewed during the awake oral exam. Signs of: discharge, discoloration, draining tracts, fistulas, inflammation, masses, swelling or ulceration should be noted on the dental chart if identified. Any abnormalities in these areas can be investigated in greater depth after the animal is sedated or under anesthesia. Notice incisor malocclusion with otoscope. The comprehensive oral exam requires an adequate light source, a dental radiograph machine, a periodontal and explorer probe. It is additionally helpful to have magnification, atraumatic soft tissue retractors, mouth gags, props or wedges, Finoff transilluminator, an adequately sized uncluttered work area and a dental assistant. For rabbits, specialized equipment such as: cheek pouch dialators and patient positioning devices are very useful. The intraoral exam under anesthesia allows for a meticulous systematic approach. The larynx, oropharynx, tonsils, soft palate, hard palate, incisive papilla, gingiva, alveolar mucosa, buccal mucosa, tongue, the floor of the mouth and salivary structures can be visualized. The teeth and periodontal tissues can be evaluated visually, by tactile probing, with dental radiographs and by transillumination. Left and right tonsilar crypts. Central soft palate lesion on 5 year cat. as protrusions from the tonsilar crypts. continuous from side to side. palate or palatal defect may exist. 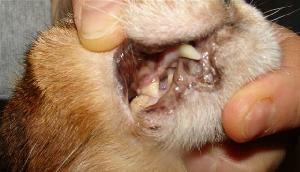 The incisive papilla is a normal central Cat with caudal stomatitis. upper incisor teeth (in cats and dogs). Hard palate chemical burn. 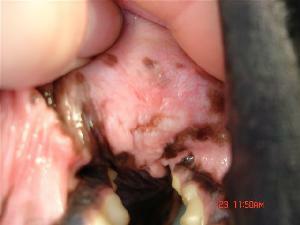 Ulcerated alveolar mucosa above the canine. Note; twinning of the left incisor. typical appearence with "CUPS". buccal mucosa (stomatitis). foreign objects often become entrapped. Tongue ulcerations associated with Tongue plasma cell tumor. Sublingual (below the tongue) Nerve sheath tumor in 20 yr. cat. Hard and soft palate of a cat. Lip ulcration of a nonsedated cat. The teeth are evaluated for the: correct number, appropriate color, shape, size and for coronal defects after they have been thoroughly scaled and polished. The author prefers to start the dental exam with the patient in left lateral recumbancy. The right upper and lower dental arches are initially evaluated for the full complement of 42 secondary teeth in dogs. To quickly ensure all teeth are present, look for four canines and 12 incisors. Observe the right upper fourth premolar, the largest tooth of the upper arch and the third, second and first premolars in successive positions mesial (forward or rostral) to the fourth premolar. Immediately distal (behind or caudal) to the upper fourth premolar are the first and second molars. On the lower dental arch, view the first molar, the largest tooth on the mandible. Observe the four lower premolars mesial to the first lower molar, and the second and third lower molars distal to the lower first molar. The left side is then evaluated and compared to the right. Missing teeth are circled on the dental chart, and supernumerary teeth are drawn onto the chart in the location they are observed. The following dental formulas are used to evaluate for the full complement of teeth. The formula accounts for the teeth on one side. The upper number represents the upper dental arch and the lower number for the lower arch. The total number of teeth is determined by multiplying the formula total by two since the left and right sides are symmetrical. Low case letters indicate primary teeth and capitalized letters are the secondary teeth. Accumulations of plaque and calculus, the presence of gingival inflammation, furcation exposure and tooth mobility are noted on the dental chart. Evidence of furcation exposure or tooth mobility are important observations that suggest advanced periodontal disease or other pathology. Periodontal probing and dental radiographs are needed to evaluate the extent of periodontal disease. To make these evaluations simple and consistent (between periodic oral exams and with different evaluators), plaque, calculus and gingival indices are used. Tooth furcation and mobility indices with periodontal disease staging may also be recorded. The author uses a one through three score for each assessment other than periodontal disease (one through four), and only abnormal findings are charted. For plaque and calculus, a score of one would be a relatively small amount, two would indicate moderate and three heavy accumulations. For gingival scoring; one would be minimal, two moderate, and three significant inflammation. The furcation, gingival, mobility and periodontal disease scores are recorded adjacent to each tooth, and the plaque and calculus indices are general assessments of the full dentition. CI-3 Heavy calculus deposits on crown and subgingivally. PI-0 No plaque; not charted. PI-1 Minimal grey-tan plaque deposits. PI-2 Moderately dense grey-tan plaque deposits. PI-3 Heavy plaque deposition exudes from gingival sulcus. These indices are charted in boxes above or below affected teeth. GI-0 Normal gingival shape and color; not charted. GI-1 Mild gingival inflammation, swelling and slight red color. GI-2 Moderate gingival inflammation, swelling, red with bleeding. GI-3 Severe gingival inflammation, swelling, bright red with bleeding. The furcation is the bony space between roots of teeth having multiple roots. furcation scores reflect more severe local periodontal disease destruction. F-1 Furcation exposure; probe enters furcation. F-2 Moderate furcation exposure; probe depth 1-2 mm. F-3 Extensive furcation exposure; probe passes from one side all the way through. Also called "through and through" furcation exposure. Tooth mobility can be related to periodontal disease, root fracture or neoplasia. M-2 Moderate tooth mobility <1 mm. M-3 Severe tooth mobility >1 mm. Periodontal disease is staged based on the degree of periodontal destruction. Dental radiographs with periodontal probing are the fundamental diagnostic tests used. PD-1 Stage 1 periodontal disease; no attachment loss. 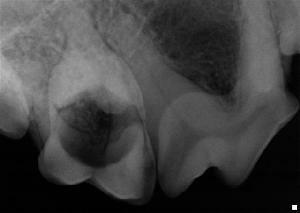 PD-2 Stage 2 periodontal disease; 0-25% attachment loss. PD-3 Stage 3 periodontal disease; 25-50% attachment loss. PD-4 Stage 4 periodontal disease; >50% attachment loss. It is very important to recognize areas of the dentition that have particularly heavy accumulations of plaque and calculus compared to the contralateral side. This may be an indication of inadequate occlusal function, lack of use due to oral pain, or other causes. Regional disparity between objective indices is an indication for very careful observation, tactile assessments and full mouth dental radiographs. The color of teeth is dependent on: dental care, diet, age and other factors. Professional and home dental care will reduce accumulations of plaque and calculus that will affect tooth color. Dietary factors can influence accumulations of plaque and calculus as well as introduce biochemicals that may affect tooth color. The author frequently observes veterinary patients having teeth with a red or black dental discoloration. These discolorations are presumed to be related to minerals in local water supplies. Tooth color is affected by age and dental maturation (tooth development). Young cats and dogs have wide pulp chambers, and thin dentin walls compared to older animals. The outer enamel layer of the tooth is non-living and remains approximately the same thickness throughout life. Changes related to abrasion and attrition affect tooth color. As animals age, the dentin walls develop (or enlarge) resulting in greater tooth density with a yellow, tan or "off white" appearance. The elderly patient may develop sclerotic dentin and pulp chamber shrinkage which may result in a glassy or transparent appearance to the teeth. Nutrition, general health and antimicrobial therapy may have an affect on enamel formation and ultimately affect tooth color. Tetracycline administration has been reported to affect the formation of hydroxyappetite of secondary teeth, resulting in tooth discoloration. Infectious disease or malnutrition may disrupt normal enamelogenesis and result in enamel defects. These defects can result in irregular dentin formation and tooth discoloration. Enamel defects cause plaque and calculus retention, which contribute to tooth discoloration. Extraoral or intraoral occlusal trauma may result in tooth wear, fractures or pulpitis. Dentin responds to chronic trauma by production of reparative (tertiary) dentin. Reparative dentin will increase the tooth density and affect tooth color. The pulp responds to trauma with an inflammatory response as an attempt to repair; however, pulp necrosis with tooth discoloration frequently occurs. Teeth that are purple, pink, tan, brown, black or just "off white" should be evaluated further. Discolored teeth may have reversible pulpitis, irreversible pulpitis and may be non-vital. Discolored teeth should be evaluated tactilly with an explorer probe for dentin or pulp exposure, and with dental radiographs for endodontic pathology. Discolored upper left canine tooth due Malformed and discolored right lower molar. to blunt trauma and pulpitis. Discoloration due to wear, and near Enamel defects and tooth discoloration. Discolored non-vital teeth. Discolored tooth with an "amalgam tattoo". that has resulted in tooth discoloration. author's area, the iron content of and discoloration of the teeth. water results in dental discoloration. tooth. Sclerotic dentin develops with of the same patient. Transillumination of discolored teeth may help determine tooth vitality. The author uses a Finoff transilluminator to direct light through the potentially nonvital tooth. The transilluminated tooth may emit a pink glow. This pink glow results from the illumination of blood flowing through the pulp and is consistent with tooth vitality. A tooth that appears relatively dark, and does not have the pink glow compared with adjacent and contralateral teeth is likely non-vital. 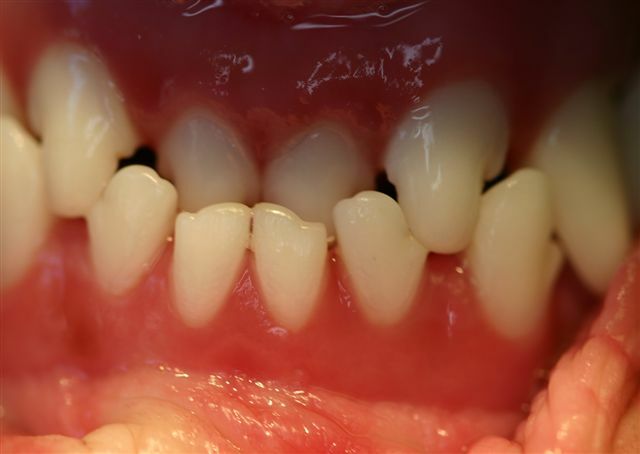 Transillumination is an inexact procedure in older patients due to the variability in tooth density; however, for younger patients the procedure is helpful. Knowledge of the correct shape and size of teeth is necessary to recognize abnormal teeth (anomalous). Peg teeth are one example of anomalous teeth that are smaller than usual with a single cusp. The author recommends that the veterinarian have skulls, models, photographs and dental charts to compare with their patient's dentition to help recognize anamolous teeth. Anomalous teeth may be an incidental finding, a functional problem or a contributing factor for the development of periodontal disease. All anomalous teeth should be probed for enamel and periodontal defects, as well as, radiographed for periodontal and endodontic pathology. have the correct shape. a "slab fracture" with pulp exposure. secondary canine tooth. distal aspect of the tooth. Coronal defects may involve only the enamel, the enamel and dentin, "near pulp exposure" or direct pulp exposure. Teeth with coronal defects often have rough surfaces with accumulations of plaque and calculus. Dental radiographs of these teeth are needed for further evaluation. Every veterinarian has observed tooth defects, dental fractures and tooth resorption. 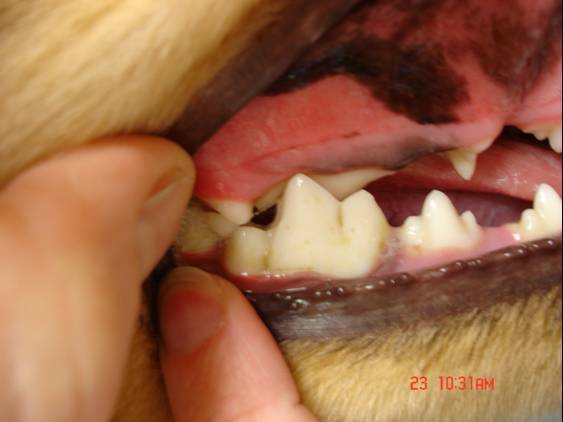 The carnasial teeth are frequently chipped or fractured in dogs allowed to chew hard objects. Caged animals with separation anxiety frequently create incisor, canine and premolar defects, or fractures trying to escape from their cages. 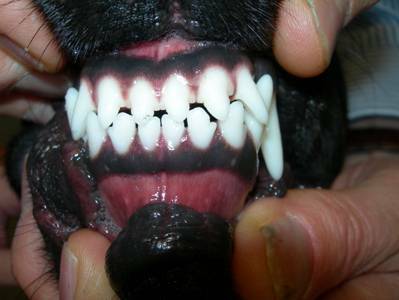 These canine dental defects are particularly common and have been called "cage chewer's syndrome" (see photo). Dogs that habitually carry tennis balls develop severe dental abrasion (wear). Dental attrition is abnormal coronal wear due to excessive mastication or chewing. The "slab fracture" of the upper fourth premolar (carnasial) tooth frequently results in suborbital swellings. The cause of the swelling seems obvious; however, misdiagnosis and mistreatment for suborbital lesions is common when dental radiography is not used. Tooth root abscess of the upper third premolar and upper first molar must be ruled out as well as foreign body penetration, infectious or neoplastic diseases prior to extracting the fourth premolar. The author recommends that the veterinarian take dental radiographs of the upper and lower carnasials, as well as, the adjacent premolar and molar teeth to avoid missing additional problems. Unfortunately, lingual fractures of the lower first molar are common and frequently missed during routine oral examinations. Dental caries (cavities) are an additional example of dental defects. They appear frequently in dogs, and the molar teeth are the most frequently affected teeth. Dental caries may involve the tooth crown or root. Tooth resorption occurs very frequently in cats (formerly called "neck lesions", "resorptive lesions", "erosive lesions" or "feline odontoclastic resorptive lesions") and occasionally in dogs. The identification of tooth resorption on an oral exam is a strong indication for dental radiography. An animal with one visable lesion is likely to have more. Enamel defect resulted after the Enamel defect on upper incisor. Enamel and dentin fracture without Enamel defect from "cage chewing"
pulp exposure. behavior or separation anxiety. of the right upper fourth premolar. exposure. exposure of this right upper aspect of the lower molar tooth. 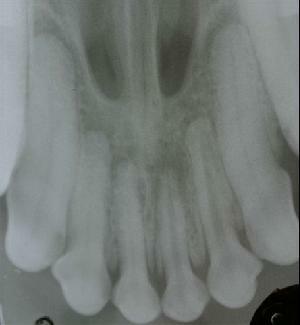 Tooth resorption in a dog. 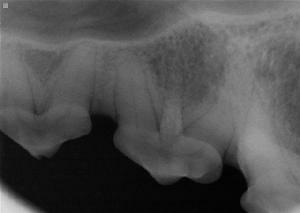 Tooth resorption in a cat. The author prefers to evaluate the soft tissues after the teeth have been evaluated. All four dental arches are evaluated for normal color and gingival anatomy. The initial focus is on the attached gingiva. There should be a minimum of two millimeters of attached pink gingiva around every tooth. Gingival defects or recession may result in less than two millimeters of attached gingiva. Gingival discoloration, inflammation and edema may also be evident. The attached gingiva provides protection for teeth and other periodontal structures. The loss of attached gingiva creates a risk for periodontal progression or endodontic disease development (or both) and the eventual loss of adjacent teeth. The mucogingival line is a clinically important mucosal region. If discharge or fistulas are identified at or apical to the mucogingival line, the adjacent tooth is suspect for endodontic disease. If discharge or fistulas are identified coronal to the mucogingival line, periodontal disease is suspected. Dental radiographs are necessary when these fistulas are identified for further evaluation. Endodontic fistula located at the Periodontal probe placed into a.
mucogingival line. similar mucosal fistula. The buccal mucosa should be carefully observed for defects, enlargements, lacerations, masses and ulcerations. Chronic ulcerative paradental stomatitis (CUPS) is a common problem for many dogs. These animals present with ulcerative lesions of the buccal mucosa as well as the tongue surfaces that come in contact with teeth. This is an immune mediated disease process to plaque bacteria, and has also been referred to as "plaque intolerance". 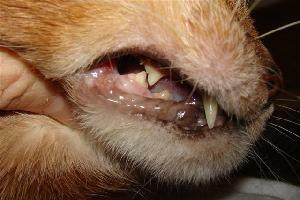 CUPS is somewhat similar to feline stomatitis; however, perhaps less widespread. evaluation of these lesions. "gum chewer's syndrome". Buccal mucosal swelling above the Fluctuant mucosal swelling. right upper fourth premolar tooth. Oronasal fistula of the buccal mucosa Lower lip avulsion in a cat. of a 5 yr. Dachshund. Periodontal and explorer probes are used for tactile assessments of teeth, and periodontal tissue assessment. Explorer probes are made with various working ends. A number 17 explorer probe is useful for subtle evaluation of enamel, dentin and cementum, or for pulp exposure. The shepherds hook explorer probe is useful for the evaluation of dental integrity and evidence of pulp exposure. The periodontal probe is used for a three dimensional assessment of the periodontium. The periodontal probe is placed at six imaginary points of the tooth. The author prefers to probe the facial (buccal) surface from the mesial aspect (front) to the middle point, and then at the distal aspect (back) of the tooth. The probe is then positioned at the distal aspect of the lingual (tongue side), or palatal surface, and continues at the middle and mesial points of each tooth. Periodontal probing of the four dental arches takes approximately 60 seconds with the help of a dental assistant recording abnormal findings on the dental chart. periodontal defects. a normal 3 mm sulcus depth. and fourth premolar teeth revealed a of soft tissue and bone is evident. Dental radiography is an essential diagnostic modality for evaluation of tooth, bone and the identification of foreign bodies. The following images provide examples of the value of dental radiography. suspected to be nonvital. incisors with wide root canals. diagnosis of a supernumerary tooth periodontal disease. root of this left upper third premolar. the teeth continue to develop normally. Computed tomography is a tremendously useful diagnostic tool for the evaluation of the TMJ. It can also help evaluate teeth and bony structures of the head for: cats, dogs, rabbits, chinchilla and guinea pigs. MRI, as well as, ultrasound can be used to evaluate soft tissue structures of the head. These diagnostic modalities are all available through Dr. Kressin in Milwaukee. An oral exam should be included with every physical examination performed for companion animals. It is necessary to be familiar with normal anatomy and variations of anatomy between breeds to be able to recognize potential problems. Abnormalities identified during the initial awake exam need to be investigated further. The comprehensive oral exam is a detailed and systematic evaluation of dental, periodontal and oral cavity structures under anesthesia. The use of a dental chart helps the evaluator avoid missing problems, and allows for comparison between examinations. Plaque and calculus indicies are quantitative assessments of plaque and calculus deposition on teeth. Gingival, furcation, mobility and periodontal disease indices are useful assessments of the periodontal health. These indices are charted only when problems are identified. Dental charts provide excellent documentation of the oral exam for the medical record. Dental radiographs, periodontal and dental probing, as well as, transillumination of teeth are fundamentally important diagnostic tests used in the comprehensive oral exam. Information from the comprehensive oral exam can be used in dental consultations with clients for effective communication about necessary treatment plans for their companion animals.